Darlings, it was Ms. Audrey Hepburn herself who proclaimed “You can always tell what kind of a person a man really thinks you are by the earrings he gives you.” But who needs a boy – regardless of his magnitude of cuteness – to give you a pair of earrings, when you can simply take home a jaw-dropping duo of your own courtesy of the ultra-talented Ashly McLean of Asquared Jewelry? Oui, oui, dolls! 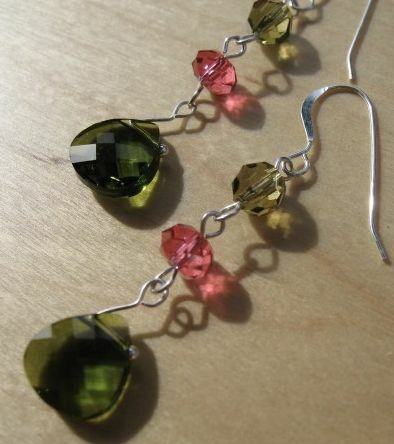 Café Fashionista has teamed up with Asquared Jewelry to bring one (1) of you gem-loving glamazons a pair of the very fall appropriate Olivine and Padparadscha Swarovski Crystal Sterling Silver Earrings! ♥Visit the Asquared Jewelry Shop and select your favorite piece. ♥ For one (1) entry, leave a comment on this post stating what your favorite Asquared piece is between now and Friday, October 29, 2010 at midnight PST. ♥ For two (2) entries, Twitter about this giveaway, and leave a comment on this post stating what your favorite Asquared piece is between now and Friday, October 29, 2010 at midnight PST with your Twitter URL. ♥ For three (3) entries, become a follower of Café Fashionista on Blogger/Google Reader/Google Friend Connect/Twitter, and leave a comment on this post stating what your favorite Asquared piece is between now and Friday, October 29, 2010 at midnight PST (if you are already a Café Fashionista follower, please say so in your comment). I will randomly pick one (1) name out of a hat (who knows, it could be yours! ), and announce the winner on Saturday, October 30, 2010. Thanks to Asquared Jewelry for the picture. Oooooo I love the sterling-silver-key-necklace!! It reminds me of the Tiffany Key!! Count me in please! I like the sterling silver key necklace too. :) The honeycomb one is really interesting as well though. Love the Bermuda Blue Swarovski Crystal Gold Necklace. I follow you on GFC, Bloglovin' and Twitter. My favorite Asquared piece is "Pearl and Swarovski Crystal Earrings" . I love all of the jewelry here, but I adore the Light Pink Coral Flower Gold Stud earrings and the Cross and Pearl Gold Necklace. I hope you have a happy weekend. Boo! I would adore entering this giveaway if my ears were pierced =(!! Beautiful. I love the White Pearl Gold Necklace. So many pretty things over there! I think my favorite is the sterling silver key necklace. Awesome giveaway, Erika! Ah, what a beautiful pair of earrings! A pity I can't join, but I'm crossing my fingers for one of the lovely ladies here. By the way, that pic of you in the last post is too adorable! I had way too many fashion faux-pas when I was a child (including neon leggings and very similar biker shorts). First of all, thank you for finding this amazing etsy shop! The jewelery is amazing, and affordable. I tweeted about it, and I am following you! Yay how pretty! I love the pearl flower gold necklace. Thanks for another amazing giveaway and i hope you have a great weekend love! :O Love this giveaway! I like the Seahorse and Coral Gold Necklace. I am a follower on GFC and Twitter. Swarovski Crystal Baroque Sterling Silver Necklace! Erika! I love the Gold Tree Necklace - it's GORGE! ps-i follow you here and on twitter! yahoo! I looooove the Swarovski Crystal Baroque Sterling Silver Necklace. I'm a proud GFC follower! Best treat before Halloween ever! Love the earrings. Cool give away and good luck to whoever wins! Take care Erica dear. Ooh, I absolutely love the White Pearl Gold Necklace! I follow, of course! OH SO PERTY. But I think I should back away from more jewelry. I'm loving your post below. Faux pas? YOU LOOK FIERCE. I'm a follower of yours on Google Friend Connect/Blogger and Twitter! Thanks for the great giveaway! Lovely earings! LOVE the gold seahorse necklace-seafoam green! I am really digging the gold orchid necklace. I absolutely adore the Bermuda Blue Swarovski Crystal Gold Necklace. It's simple, yet stunning.. the perfect accessory for an LBD or a white t and jeans. I think a necklace like that speaks for itself! Thanks for posting this contest! I think it's totally rad. I like the Pearl and Swarovski Crystal Earrings - classic and stunning. I follow on twitter. My favorite piece is Bermuda Blue Swarovski Crystal Gold Necklace.The colour is stunning , a timeless. piece.loved much. You always have awesome giveaways!! I hope to have one on my blog soon. I love the gold and purple earrings and how the gold shines and sparkles!